Yes, high school reunions get a bad rap. From the tacky music to the one-upsmanship, they are they event we all dread to attend, but can't resist. Library school reunions, however, are a whole other kettle of fish. Library school was where I discovered my love of medical librarianship, learned what my values were as a professional, and discovered who my future colleagues were going to be. I'm psyched to attend the Library School Reunion event at MLA '17 on Monday night. I'll be back in the city I graduated from (Go Huskies! ), and I hope to discover new friends who loved UW's iSchool as much as I did. Come join me at the reunion, and we can laugh at old school pictures together. P.S. : the first person who guesses which munchkin is me in the school photo gets a Starbucks card - trust me, you'll have opportunity to use it! Front row, just above the school sign. Wearing blue dress with pink t-shirt? Yes! You got it! 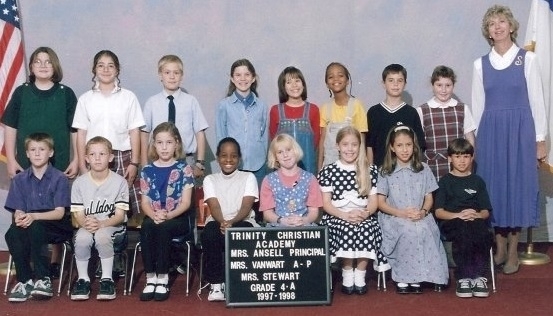 I'm the dork wearing the jean tweety-bird jumper and pink t-shirt, because style: I had none. Check your email for your prize! (and apologies for the delay - I stopped checking once the pre-conference madness set in).